Inst was founded by the public subscription of the citizens of Belfast in the early years of the nineteenth century. The foundation stone of the magnificent John Soane designed building, perhaps the finest example of late Georgian architecture anywhere in Ireland, was laid in July 1810 by George Augustus Chichester, the Second Marquis of Donegall. 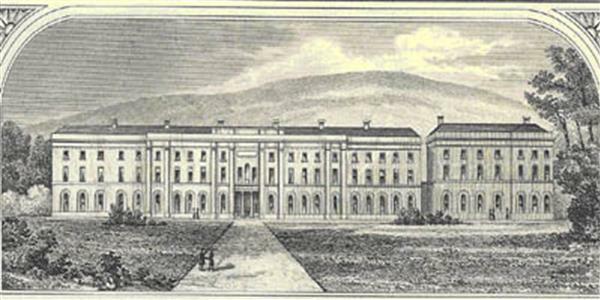 Belfast Academical Institution opened on 1st February, 1814, as both a school for pupils and a college for students. On the occasion, Dr. William Drennan, a founder, spoke of what he envisaged as the main purpose of Inst, which was to diffuse useful knowledge, particularly among the middling orders of society, as one of the necessities rather than of the luxuries of life; not to have a good education only the portion of the rich and the noble, but as a patrimony of the whole people. From 1814 until 1849, Inst had both a School Department and a Collegiate Department. Pupils matriculated from the School Department into the Collegiate Department. The Inst general certificate, taken in the Collegiate Department, was recognized as equivalent to a degree of the Scottish Universities. Many of the students who took the Inst general certificate were aspirants to the ministry of the Presbyterian Church. Between 1835 and 1849, Inst also had a medical school in the Collegiate Department, the first medical school in Ulster. The Inst medical certificate was recognized by the main licensing colleges in Dublin, Edinburgh and London. Over five hundred doctors were trained at Inst between 1835 and 1849. In this period, Inst ran its own teaching hospital, the Royal Institution Hospital in Barrack Street, sometimes known as the College Hospital. The government decision in 1845 to found the Queen’s Colleges in Ireland spelt the end of the Collegiate Department at Inst. However, a considerable number of the Inst professors transferred to Queen’s College, Belfast (later Queen’s University). In many respects Inst provided the main foundation for Queen’s College, Belfast, in particular of the Queen’s Medical Faculty. Indeed, the old Inst dissecting rooms were still being used by medical students from Queen’s College until the early 1860s. So, from 1849 until the present day, Inst has been a school for pupils only. In 2019, Inst has over one thousand pupils. In the nineteenth century, the numbers were fewer, only two or three hundred. In the second half of the nineteenth century about three hundred boys attended Inst. There was no standard course as such. Boys’ parents paid only for the subjects their sons took. Mathematics, English and Writing were the most popular subjects, Classics and French less so. From 1814 until 1903, Inst had two boarding houses, the English Boarding House at the north end of the Soane building and the Classical Boarding House at the south end. However, the boarding houses closed in 1901 and 1902, due to improving transport services into Belfast and, more importantly, the need to provide additional classroom space to accommodate the greatly increasing numbers of pupils seeking enrolment. From 1902 until today, Inst has been a day school only. In 1831, King William IV granted Inst a Royal title. The Joint Boards of Managers and Visitors accepted the title, less out of loyalty, than the need to appropriately distance the Institution, in the later nineteenth century, from its radical-republican origins and to secure a government grant to maintain the Collegiate Department. From 1831 until today, the School’s full title has been, The Royal Belfast Academical Institution. Until 1951, Inst used the Royal Arms on its stationery and uniform items. In 1951, as a result of some concern that use of the Royal Arms by a school was inappropriate, the current Arms was developed and adopted. Between 1864 and 1898 Inst had a small Preparatory School on the main site in College Square, situated in the North Wing. However, declining number caused it to close in 1898. In 1917, the Board of Governors opened a new Preparatory School, with a small boarding department, Inchmarlo, in south Belfast, in Marlborough Park North. In 1935, Inchmarlo transferred from Marlborough Park to its present site at Mount Randal in Cranmore Park. The Preparatory School is an integral part of The Royal Belfast Academical Institution. For most of the first hundred years of its existence, Inst did not have a Principal or a Headmaster as such. The radical-democratic origins of the Institution in the early nineteenth century had contributed to a situation where the academic and administrative direction of the school was in the hands of a group of senior teachers (the Headmasters) who sat on the Board of Masters. However, by 1898, this was proving an impediment to progress and in that year Robert Dods, Headmaster of Modern Languages, was appointed Inst’s first Principal, although he was in office for only a year. Since then Inst has had eight Principals, R. M. Jones (1898-1925), G. Garrod (1925-1939), J. C. A. Brierley (1939-1940), J. H. Grummitt (1940-1959), S. V. Peskett (1959-1978), T. J. Garrett (1978-1990), R. M. Ridley (1990-2006). The current Principal, Miss J. A. Williamson was appointed in January 2007 and is the first female to hold the post. Inst first won the rugby Schools’ Cup in 1888 and since then the trophy has been won twenty-nine times. Seventy-eight Instonians have played for Ireland and eleven for the British and Irish Lions. Two Instonians have captained the Lions. In the nineteenth century lacrosse was a much favoured and successful Inst sport. Rugby, cricket hockey and soccer are currently the main school sports, although many other sports are played by Inst pupils. In 1902, at a time of financial difficulty, the Board of Governors took the decision to lease the north front lawn to Belfast Corporation for the building of the Belfast Municipal Technical Institute. Although regarded by some as an act of extraordinary architectural sacrilege, the arrangement did, nevertheless, provide the Institution with an annual rent of £1,350. This enabled the purchase of the magnificent grounds at Osborne Park in 1905 as well as a number of vital improvements to the fabric of the main Soane building. By the time of the Centenary celebrations in 1910, Inst’s reputation as a great school was secured. The Great War of 1914-1918, took an enormous toll on the school and Old Instonians. One hundred and thirty-two Old Instonians made the supreme sacrifice and two hundred and thirteen decorations were won, including a Victoria Cross. An Officer Training Corps was founded in the School. In the 1920s, in the period of Geoffrey Garrod’s principalship, the House system was founded, the school song was written and a school uniform, including the ubiquitous yellow and black quartered cap, was worn for the first time. The cultural life of Inst, in particular music and drama, improved significantly. A scout troop was founded and rowing became a popular school sport. In the Second World War, one hundred and six Old Instonians fell in the conflict. Despite the severity of the blitz on Belfast the school escaped significant damage. During the war, younger pupils attended ‘branch’ schools at The Royal School, Dungannon, and at the house known as Fairy Hill in Osborne Gardens. Air-raid shelters were built on the rear quad and a barrage balloon was anchored to the middle of the front lawn. The serious civil disorder affecting Belfast in the 1970s and 1980s was a considerable challenge to Inst as a city centre school. However, despite the difficulties of the situation, Inst is proud of the fact that not one school day was lost in this period. Since the 1980s, a number of major building projects have transformed Inst into one of the best equipped schools in Ireland: the superb Jack McDowell Pavilion at Osborne Park, the purpose built Sixth Form Centre, a multi-function Sports Centre and Fitness Suite, the Christ Church Centre of Excellence, the magnificent new pavilion at Bladon Park, a top quality water based synthetic hockey pitch at Shaw’s Bridge and the Centre of Innovation in the Technology Department. Inst currently has over one thousand pupils on the main site and over two hundred pupils in the Preparatory Department, Inchmarlo. About one hundred and fifty new pupils enter Inst every year from a wide variety of backgrounds: social, cultural and academic. The school encourages excellence and participation and ensures that every boy is supported pastorally so that he can perform to his potential. For many years, the Royal Belfast Academical Institution has been the top performing all boys’ school in Northern Ireland. RBAI is committed to realistic and robust self-evaluation, as an integral tool, in a School improvement strategy which leads to raised standards of teaching for learning for each pupil. This is alongside outstanding pastoral support to enable each student to develop academically, emotionally, personally and socially through active and challenging learning experiences. The agreed priorities of the School Development Plan and Department Development Plans reinforce and restate what makes us successful and what will continue to provide excellent opportunities for our pupils. Resources will continue to be effectively deployed to support learning, including use of online learning. Excellent practice is retained with a focus on student achievement and a collective sense of ownership. The priority will include consistency across the School and evidence based planning, which will respond to internal and external requirements and which will maintain focused and monitored outcomes. To develop each pupil to his maximum academic potential and to stimulate him to enjoy the attainment of knowledge and excellence. The School will offer a broad and balanced range of subjects within which boys may choose appropriate courses. The School will provide comprehensive pastoral care. All boys will be encouraged to develop a wide range of learning skills, to acquire habits of self-study and inquiry. To provide each pupil with the knowledge and skills necessary for everyday and working life. The broad curriculum will cover areas of experience from the expressive and creative to the scientific and technological. Appropriate use will be made of educational technology. There will be a comprehensive careers education, information, advice and guidance programme. Extra-curricular programmes will complement the academic courses. To provide and promote the conditions in which each pupil can develop as an individual and to his potential. The School will encourage tolerance, service, discipline, reliability and responsibility. The School will help pupils to recognise their strengths and weaknesses. To prepare pupils to become responsible and active members of society. The School will foster awareness of the structure of today's societies. Pupils will develop an awareness of man's heritage in a wide range of areas. The School will encourage initiative and co-operation as well as developing suitable attitudes towards healthy competition.